2 What is the Front-end? The aim of this document is to outline things that can be done to manage Articles using the Front-end of the Joomla! site. Some important functions can be done here without the permissions to login to the Back-end. It is one of a series of documents introducing Joomla! version 1.5. You need to be logged in with a username with at least Author permissions. It is useful for people who will administer a site to know that some tasks can be done using the Front-end, so even the experienced should have a go here. The Front-end of a Joomla! site is the public interface. It is the part seen by any visitor to the site and you have already used it for adding and altering content. Authors, Editors and Publishers can login to this part of the site, as you have already seen. There is a Back-end to a Joomla! site, which is restricted to people with levels of administrator permissions. 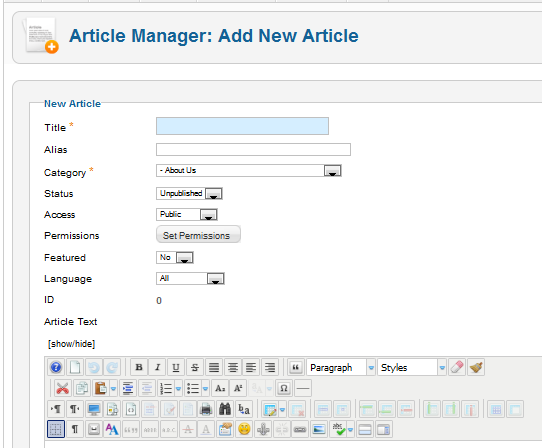 Here there is management of Articles, Sections, Categories, Menus, Users and much else. If you are an Author or Publisher, you do not have access to the Back-end. If you are using localhost - you are may be running as the administrator and can use the Back-end. Some content management can be done from the Front-end and many Web sites encourage their contributors to do this as it makes the site more interactive and responsive to change. To keep a site up-to-date, it is good policy to clear out old content. This is especially applicable to news items or information about events that have past. Unpublishing makes the article invisible to the normal visitor to the web site. You will still be able to see it - but the edit icon is now a different colour and if you pass the mouse pointer over the title - it gives the information that it is Unpublished. To get it removed entirely - the site administrator has to delete it in the Back-end. This too is done in the Publishing part of the editor screen. The detail depends on the design of the web site in use. When an article is created, you often select a Section and a Category for it (or leave it uncategorised). You can change the selection to a different Section and Category later. an Articles is contained in a Category and displayed in the Menus - details of which have been set up by the system administrators in the course of developing the site. a Section contains one or more Categories. Each Category can have articles assigned to it. This is what you are doing in the Publishing section of the editing screen. Schedule an article with dates in Start Publishing and Finish Publishing. Front Page: this is rarely altered to Yes. There are documents in this series about the Administrator Back-end of Joomla! web sites. These also have references to comprehensive documentation about Administration.